Introduction: Scientists and the public are interested in rapid and continuous monitoring of pesticide residues present in or on food using sensitive and low-cost tools. 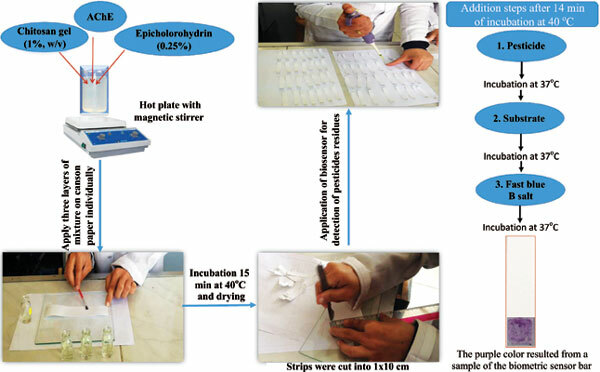 The present study developed and optimized a sensitive visual screening tool using a bio-based paper for the detection of cholinesteraseinhibiting insecticides. Method: The technique based on the change of the intensity of a purple color formed from diazonium (azo) dye that appears when α- naphthyl acetate (α-NA) is hydrolyzed by Acetylcholinesterase (AChE) in the presence of Fast blue-B as a chromogenic agent. Results: The color intensity is proportional to the concentration of ester-containing Organophosphorus (OP) and carbamate compounds. The experiment used Plackett-Burman Design (PBD) protocol in Minitab software to estimate the influence of different variables on the in vitro activity of AChE determinations under immobilization conditions. I50 values of six OP and five carbamate insecticides were calculated. Conclusion: Limit of Detection (LOD, ug/mL) of the rapid visual screening for the tested compounds were also determined, being as low as 4 µM for carbaryl and 13 µM for fenamiphos. Acetylcholinesterase, biosensor, carbamate pesticides, organophosphorus pesticides, plakette-burman design, insecticides.